There are a series of islands located off the coast of Virginia's Eastern Shore. Assateague and Chincoteague are the northern-most islands. 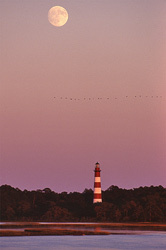 Chincoteague is developed and a popular vacation destination. Assateague is home to Assateague National Seashore and Chincoteague National Wildlife Refuge. Wallops is the next island to the south and it is the location of NASA Wallops Flight Facility. Rockets are launched from the island. Wallops Island Flight Facility has a visitors center on the mainland, but access to the island is restricted. Visit the Wallops website for launch shedules and visitor center information. The remainder of the islands to the south are undeveloped. Some of these island once supported small communities. Over time everyone moved to the mainland and now the islands are unoccupied. Many of the islands are now managed by The Nature Conservancy as part of the Virginia Coast Reserve. These islands are wonderful places to visit but you'll have to get there by boat - there are no bridges out to the undeveloped islands. If make the trip out to the islands, you're asked to stay below the high tide mark and stay away from any marked bird nesting areas. More information about the barrier islands. A good way to experience the barrier island is by kayak. Southeast Expeditions offers a variety of kayaking outings throughout the Eastern Shore. Onancock is located on the Chesapeake Bay side of the Eastern Shore peninsula but it makes a good home base for any Eastern Shore vacation. The Eastern Shore is only about 12 miles wide at it's widest point, so traveling from bayside to seaside doesn't take much doing. Although Onancock is one of the larger towns on the Shore, it's still a pretty small town. Very walkable and friendly. They have a bunch of restaurants, several bed & breakfasts, and some neat shops to explore. Wachapreague is a waterfront town that provides great access to Cedar and Parramore Island. There are several marinas in town with charter fishing boats. Boat rentals are also available if you'd like to go out exploring on your own. Cape Charles is a good base for exploring the southern part of the Eastern Shore. Cape Charles is a nice town, with restaurants, shops, marinas, and a public Chesapeake Bay beach. At the town of Oyster - just a 15 minute drive to the east - you'll find a public boat ramp where you can launch a boat or kayak. And the Barrier Island Center, where you can learn about the history of the island, is about 12 miles north of town.